The engagement party is the first wedding-related celebration in a long line of soirees, bashes and events you’ll host (or take part in) before your big day. If you’re not sure what goes into planning one, no worries! We’ve laid out all the basics for you right here. From who to invite to where to have it, this is everything you need to know to plan one epic celebration. This is engagement party 101. What is an engagement party? An engagement party is exactly what it sounds like - a soiree that celebrates your new relationship status. It’s a chance for you to really bask in that post-proposal high with all your nearest before you get down to business with wedding planning. Who is responsible for the engagement party? Either the happy couple or someone in the couple’s inner circle hosts the party. 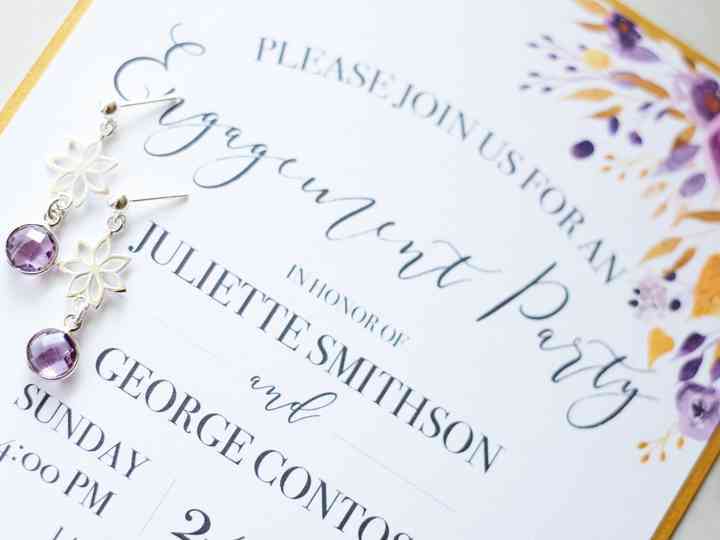 If you are planning the engagement party for the couple, you’ll want them to OK key details before deciding on a date, booking a venue and sending out invitations. Things like the theme, menu, playlist and any entertainment can remain a surprise if you want it to. The general rule is to only invite people to the engagement party who are going to be invited to your wedding. The only times that this does not apply is if you’re planning to elope or having a very intimate wedding. If you haven’t finalized your guest list, stick to your inner circle and immediate family - that way coworkers, acquaintances and more distant relatives won’t wonder if their save the date card got lost in the mail later down the line. Where should we have our engagement party? There are no rules when it comes to the engagement party venue. If you’re a super casual duo, you can host in your house or in your backyard. If you want something a little fancier, you could host it at a local restaurant. It really depends on how much you want to spend and how many people you’re hosting. What should we wear to an engagement party? Typically, the dress code is smart casual for this pre-wedding party but should be dictated by the venue and time of day. For some, the engagement party takes on a more elegant tone with an evening cocktail party while for others it could be a backyard BBQ. In either case, guests will want their outfit to be occasion appropriate and not too casual or formal (and ladies should avoid white as that hue is typically reserved for the bride should she choose to wear it). For engaged couples, all eyes will be on you, so you’ll want to choose outfits that make you look and feel your best as a twosome. When should we have our engagement party? Soon after you engaged! You’ll want your proposal story to be fresh in your mind and not be bogged down with wedding planning duties. How much should we spend on our engagement party? You don’t want to blow all of your savings before you’ve even started planning your wedding, so if your friends and family aren’t footing the bill, you’ll need to be mindful when it comes to your engagement party budget. There are plenty of ways to cut costs - like hosting your event at home and not going crazy with entertainment and eats. Since engagement parties tend to err on the more casual side, you don’t have to go all out and serve a plated meal. We suggest doing something more laid-back, like ordering pizza, doing a potluck or picking up takeout from your favourite local spot. What should one give as an engagement party gift? If you’re attending an engagement party, you may want to bring a little present for the couple, but this doesn’t have to be super extravagant and is completely optional. This could be something off their wedding registry (if they’ve set one up), a classic bridal gift like a pair of toasting flutes or a picture frame, a bottle of bubbly or a fun gift that reflects their newly engaged status.